See what all the BUZZ is about at our FALL OPEN HOUSE! Discover new classes, displays & inspiration! If you've been to the shop over the past few days, you know we've been busy as bees as we prepare the shop for a new season of sewing! So what's all the buzz about? Our FALL OPEN HOUSE is coming right up next Thursday-Saturday, September 13th - 15th! We've been shuffling fabrics around to make room for all the new collections arriving daily and let me tell you, they are sweet as honey! That means we've also been adding lots of bolts to our Bargain Basement (at $5.99/yd, that's sticky sweetness you can't resist!!!). With new collections come new projects & loads of inspiration! We have NEW quilts hanging for you to see, each with kits & patterns available. Among our new displays you'll find Halloween haunting, cheerful Christmas, a bit of Ombre Confetti sparkle, even some bold Saguaro cacti! 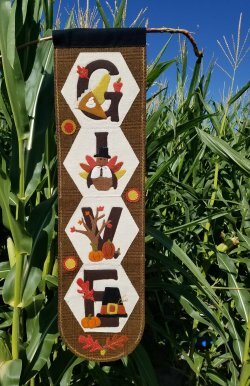 As you glean all the new autumn quilting goodness, put out your antennaes and find our signs noting our upcoming classes and be sure to pick up our current class list at the register. You'll be the queen of sewing this season when you join in a variety of bag classes (great for gift giving! ), some exciting new events and sewing bees (I'll keep you in suspense!) and new quilt making techniques that will take the sting out of tricky piecing for beginners and advanced quilters alike. Take advantage of buzzworthy Open House Specials like 10% off individual class fees, 20% off class supplies and 25% off one regular price item of your choice! If you're not able to fly into the shop, please visit our website next weekend and click on the Calendar or Classes tab to view photos, discover details and even register for fun classes, clubs and events! We can't wait to show you what's new and welcome you to swarm the hive here at Corn Wagon Quilt Co.! 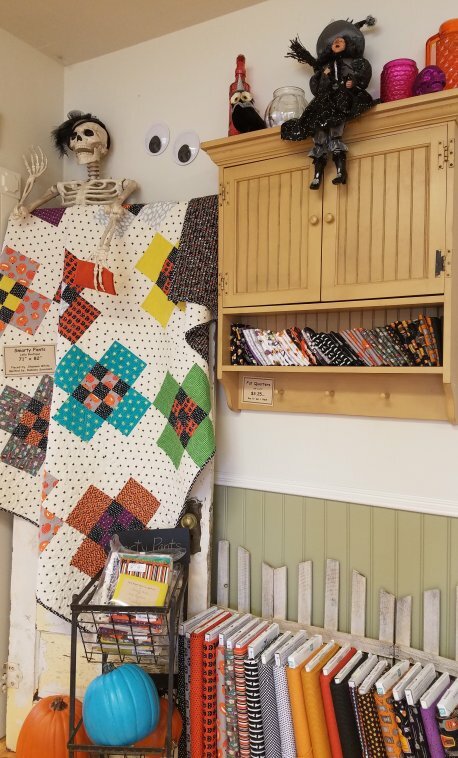 Our familiar friend, Bone-ita, is back this season to show off this playful Halloween quilt coordinated and pieced by Shannon White using a variety of Halloween prints and bright basics, available now as a kit. The scrappy nine-patch pattern is called Smarty Pants by Lella Boutique. This Hexi Door Greeter by Buttermilk Basin GIVES a warm welcome to the season as well as your guests. Kits include Marianne Michael's beautiful hand-dyed, felted wools and are part of a monthly collection of Hexi Door Greeters available here at the shop. "It's All About the Wool" is a delightful club that will continue this season here in our classroom. They meet every 2nd Tuesday, 1:00-4:00 p.m. to work on their own various wool applique and wool rug hooking projects. They share a wealth of knowledge and experience in an easy-going sewing circle of friends. $15 club fee covers September-December! If this quilt doesn't make you smile, the name will! 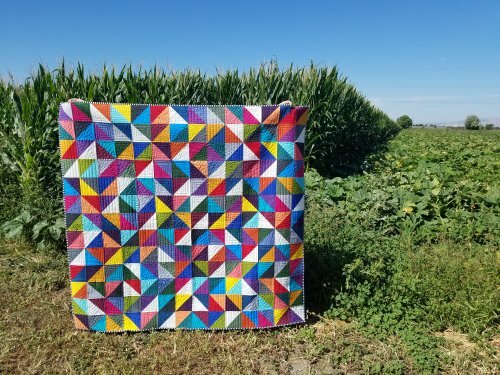 Stacey Giles has dubbed this fabulous quilt Triangles Up the Wazoo after piecing all those colorful half-square triangles. Kits include all the solids needed to piece the top and a perfect black and white striped binding. Look how Ramona Sorensen's quilting accentuates those energetic angles! September 10th - 20% off Minky & Cuddle fabrics including all regular price yardage and Cuddle kits! Thurs, Sept 13th - Sat, Sept 15th here at the shop! Our new class schedule will be hot off the press and you can enjoy discounts like 10% off individual class fees, 20% off class supplies and 25% off one regular price item of your choice! Saturday, September 15th 1 p.m. - 7 p.m. 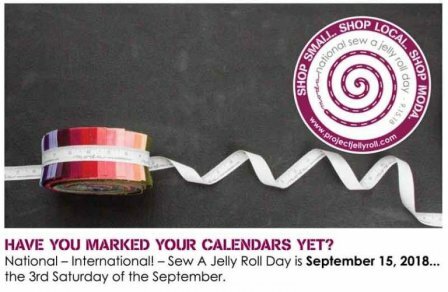 The 3rd Saturday in September has officially been designated as National Sew A Jelly Roll Day to encourage collectors to tear open a Jelly Roll and make something for themselves, as a gift or for charity! It can be a quilt or a tote bag, a pillowcase or something to wear, it doesn’t matter so long as we seize the day and celebrate the joy of being a maker. Grab a Jelly Roll, dust it off, choose a project and sew with us here at Corn Wagon Quilt Co.
See our website for all the details. Sign up online or in-store today!